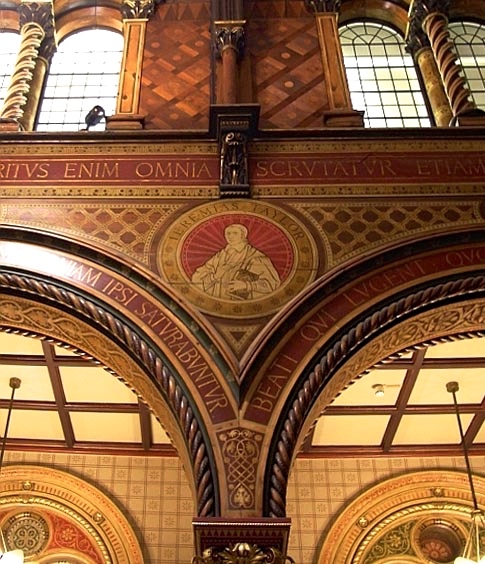 Since King's College London was founded to provide students in the capital with a Church of England university education, its chapel has always been integral to the main Strand building. Strategically placed on the first floor above the Great Hall, it is reached by an impressive double staircase from the main entrance. 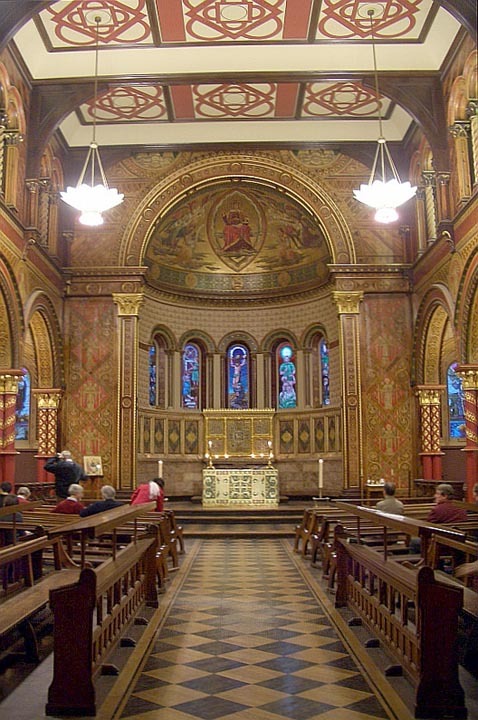 However, the chapel as originally built here by the college's architect, Robert Smirke, was designed along ecclesiological lines, and by the middle of the nineteenth-century it was considered to be too low church and plain. 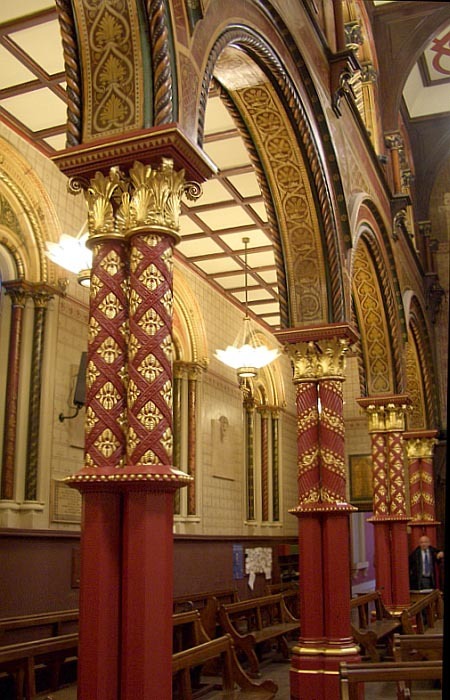 In 1859 therefore, application was made to the influential architect George Gilbert Scott for a more impressive design. The King's College authorities invited the famous architect to create a more impressive design just at the time when the Battle of the Styles was raging around Scott, and he seems to have relished the comparatively small but challenging task. "There can be no doubt," he responded, in a letter of 22 December that year, "that, in a classic building, the best mode of giving ecclesiastical character is the adoption of the form and, in some degree, the character of an ancient basilica." He went on to ponder the practical difficulties of having such a chapel on the already high first floor, where weight would be an issue, and where an apse would have to project at a considerably greater height above the ground. It is fascinating to see how he proposed to get round these unusual problems by suggesting "double columns of metal (iron decorated with brass)" instead of stone pillars, and, as for the semicircular apse, "bracketing out with iron brackets etc" (qtd. in "A Brief History"). 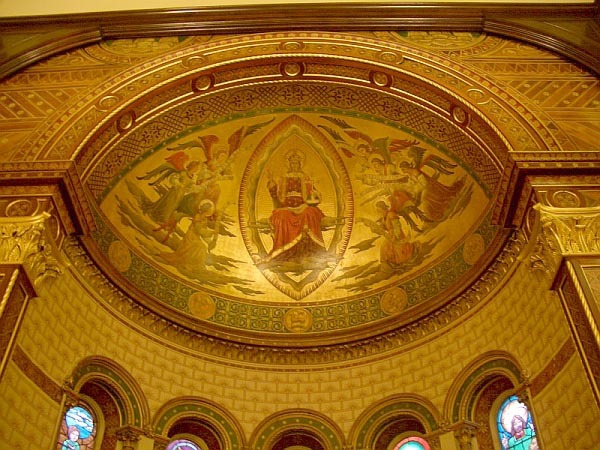 It must all have been very different from his experience in designing the chapel of Exeter College, Oxford, for example, which rose conventionally from solid ground and was completed in 1860. In the end, the apse of King's College's upper storey chapel was supported "on a curved wrought iron beam and a pair of cast iron columns, which in turn stand on an arcaded brick support structure" ("A Brief History"). Christ in majesty. Attributed to Clayton & Bell. 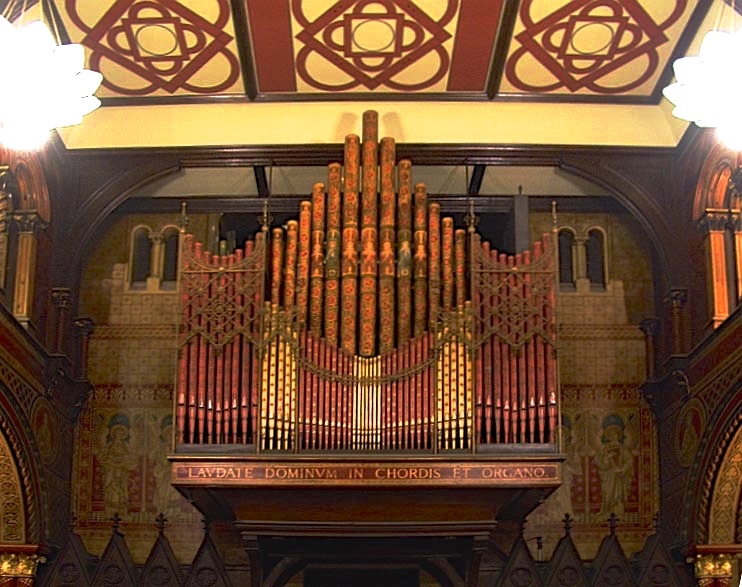 The original decoration of the chapel, which has largely been restored now, is believed to have been carried out by the well-known firm of Clayton & Bell, with which Scott had a long-standing connection. 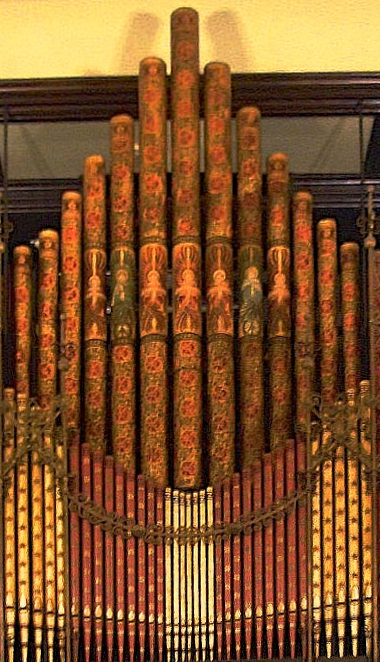 Amongst many points of interest in it are the organ by Henry Willis, which dates from the 1860s, and was reconstructed by his grandson in the 1930s, and then again at later dates: the beautiful angel designs on the largest pipes were only revealed during the latest restoration work. Roundels of prominent churchmen of the past appear in the spandrels along the nave, including one of Jeremy Taylor, the seventeenth-century royalist divine who was the spiritual adviser and good friend of John Evelyn the diarist, and who must often have passed along the Strand outside. 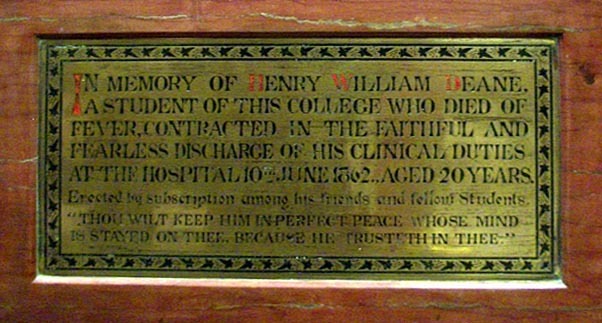 The chapel houses various poignant memorials, too, such as those to Henry William Deane, a medical student who died of fever "contracted in the faithful and fearless discharge of his clinical duties at the hospital" in 1862; Hibbert Sullivan Parker, an Army Surgeon who was an associate of the college and who died young out in the Punjab in 1886; and Thomas Rymer Jones, a long-serving Professor of Comparative Anatomy who must have "operated" deep in the basement of the college and who held that: "It is man's place to be a student not the critic of creation, his simple duty and his highest privilege consisting in the endeavour to derive from the contemplation of the Creator's attributes a clearer knowledge of himself" — a shot across the bows of Darwinism, perhaps? Professor Jones must have been doctrinally sound, because the college historian particularly mentions his "blameless years" in office (Hearnshaw 293). But he was by no means a dull teacher. 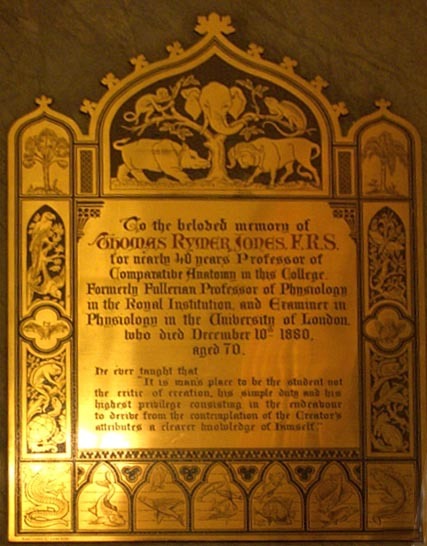 On the contrary, he was "a skilful dissector and lecturer" (Schwartz), whose passionate regard for God's handiwork made him a populariser of natural history. Amongst his publications were "Notes on the Dissection of a Tiger" (1834), and The Animal Creation: A Popular Introduction to Zoology (1865). No wonder he was given such a lively and intricately-worked memorial, with depictions of exotic animal life. 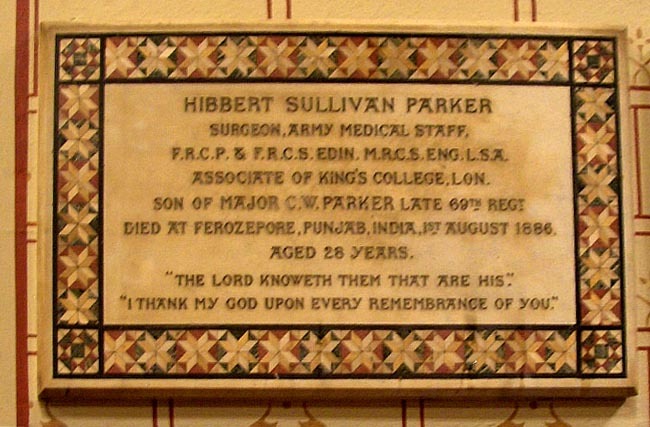 These memorials all remind us of great souls long gone, and of the importance to the college, from its inception, of its medical school and associated studies. "A Brief History of King's College Chapel at the Strand" (College publication). Hearnshaw, F. C. The Centenary History of King's College London. London: Harrap, 1929. Schwarz, Joel S. "Jones, Thomas Rymer (1810-1880)." Oxford Dictionary of National Biography. Online Ed. Viewed 6 October 2007.